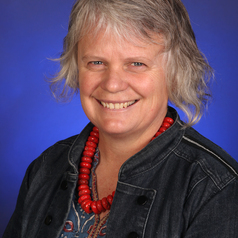 I am a senior lecturer in Te Hononga, the School of Curriculum and Pedagogy in the Faculty of Education where I teach in the Learning Languages learning area in both the primary and secondary teaching programmes, and in children's literature. The main focus of my research is in the language used in New Zealand children's picturebooks. My research has examined the use of Māori loanwords in New Zealand English picturebooks, and more recently I have begun examining the linguistic landscape of dual language picturebooks. I have also explored the link between national identity and children's picturebooks, work which has resulted in the development of two picturebook collections: The New Zealand PictureBook Collection (picturebooks.co.nz) and the New Zealand Pacific PictureBook Collection (pacificpicturebooks.co.nz).